Senator John Glenn Was NOT a Hero, Just ask the Aborted. I am old enough to remember all of the Apollo Missions. My dad woke us up if lift off was during the night or very early morning. It was a glimpse of hope, even a diversion, during a time of great turmoil. We watched every moment we could to see men explore space for the first time. Heroes were men in space suits willing to risk their lives to further our reach into space. While John Glenn did not fly during the Apollo missions, he was one of the Mercury 7 that catapulted the space program and NASA. Without test pilots like John Glenn, other men may have never walked on the moon, piloted the space shuttle or experiments on the International Space Station. It was truly a brave thing to do for all of humanity and every American. As children of the 60’s, we all thought that astronauts walked on water, mighty men, heroes. However, Mr. Glenn had a dark side that championed abortion. After Mr. Glenn became a Senator, he voted for – even championed – partial birth abortion. They irony is that Mr. Glenn’s abysmal proabort voting record may have aborted the next test pilot that could have taken us to the galaxy…and beyond. Millions of aborted children are the handiwork of Democrats like John Glenn. While you read all of the heroic stories of Ohio’s son, Astronaut, and U.S. Senator John Glenn, remember who he really was: A Proabort Democrat. God speed, Mr. Glenn….and all the children that SHOULD have been. #PartialBirthAbortion? Turn in Your Woman Card NOW. Health of the mother. Life of the mother. Only 1%. ANY woman that believes partial-birth abortion is okay in ANY situation, TURN IN YOUR WOMAN CARD NOW because YOU are the REAL WAR ON WOMEN. Here at our HQ, we are literally steps away from the monster that pioneered the partial-birth abortion procedure and taught to many other fledgling abortionists, even Kermit Gosnell. We see with our own eyes the business that has murdered thousands upon thousands of unborn children using any means necessary to kill. After all, abortion is a BUSINESS first, last, always. “Two abortion physicians, one in Ohio and one in California, independently developed variations on the method by extracting the fetus intact. The Ohio physician, Martin Haskell, called his method ‘dilation and extraction,’ or D&X. It involved dilating the woman’s cervix, then pulling the fetus through it feet first until only the head remained inside. Using scissors or another sharp instrument, the head was then punctured, and the skull compressed, so it, too, could fit through the dilated cervix….Haskell has said that he devised his D&X procedure because he wanted to find a way to perform second-trimester abortions without an overnight hospital stay, because local hospitals did not permit most abortions after 18 weeks.” NPR, 2006. What hero. And he has Hillary to thank for getting even more ignorant women to vote for it, and if you do, TURN IN YOUR WOMAN CARD NOW. Hillary seems so in love with abortion, even to the very last minute of gestation. Late-term abortion of any kind gets her elected. Partial-birth abortion gets her elected. Wearing pink gets her elected. Cecile Richards uses our federal tax money we are REQUIRED to pay to her death business, gets her elected. Hillary LOVES ABORTION. “With all that modern medicine has to offer, partial-birth abortions are not needed to save the life of the mother, and the procedure’s impact on a woman’s cervix can put future pregnancies at risk.” Former Surgeon General C. Everett Koop, M.D. Letter to the Editor The New York Times, September 26, 1996. “Most partial-birth abortions are performed on healthy mothers with healthy babies,” and “there is no obstetrical situation that requires the willful destruction of a partially delivered baby to protect the life, health or future of a woman.” Nancy Romer, M.D., Curtis Cook, M.D., Pamela Smith, M.D. and Joseph DeCook, M.D. Letter to the Editor The Wall Street Journal, October 14, 1996 The Wall Street Journal, October 14, 1996. The liberal bias regarding partial-birth abortion after the debate has been enormous. My email and feed lit up like a Christmas tree with how women NEED partial-birth abortion. Every liberal news outlet [CNN, ABC, NBC, CBS & basement dwelling Mother Jones, Vox, etc.] ‘reported’ on how wonderful partial-birth abortion is for the greater good. Babies that have to endure this heinous torture will end up in a red biohazard bucket and sent to a landfill while mommy is keeping warm with Hillary lies and rhetoric. Babies don’t need abortion for any reason, so why do women need it? Any woman that says they need abortion to be an equal part of society, TURN IN YOUR WOMAN CARD NOW. And CONGRATS!!! You’ve just stepped into your ugliest man shoes. And they are HIDEOUS. So, WOWZERS. Yes. Oh my. I cannot imagine my life being publicly debated as if being in the Colosseum, holding my breath and my heart pounding fiercely in my chest waiting for a thumbs up. That is what you saw in the debate ‘event’ last night. How dare anyone debate life? How can anyone seeking the most powerful office in this country debate whether one life is worth more than the other? Hillary powerfully told the American public that she only has regard for proabort women and Planned Parenthood because that would be the only reason she could ever get elected. Hillary is not God, despite what her virginal white suit tried to purport. And she is not innocent of the charges against her, whether in a court or in the Higher Court she will answer to one day. Hillary is literally, and I mean LITERALLY, responsible for deaths of millions of unborn babies and others she considered ‘collateral damage’ during her season of Secretary of State. She has no answer for the few she allowed to be tortured to death in Benghazi, so don’t hold your breath for the voiceless. If that lying shrew ever holds public office again, she with throw anyone under the bus, especially the most vulnerable. Hillary is a MONSTER who seeks the blood of the most innocent and ignorant women to be elected. She will never protect YOU or our military, much less unborn children; remember Benghazi? Those tortured men did not go through the horrific evil, the excruciating pain, having their skulls crushed until white brain matter came out, of partial birth abortion that Hillary supports. 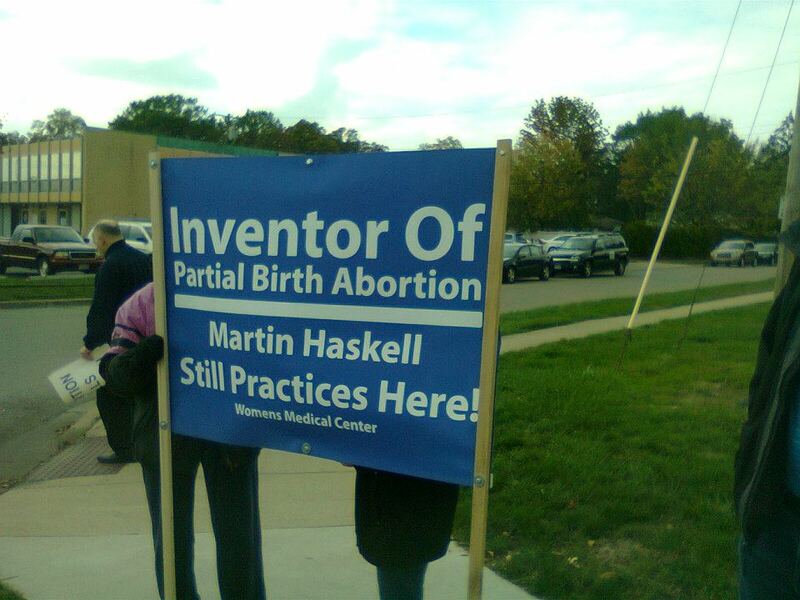 Martin Haskell – pioneer of the partial birth abortion, taught Kermit Gosnell how to ‘snip’ born babies spines, still the owner of two Ohio abortion facilities, has just ONE MORE CHANCE. Even though news agencies are claiming he has been denied his license…and for all intents and purposes it has been denied…BUT he may have one last chance because he was granted a ‘continuance’. His last day is July 10, 2014…or is it? If he had truly been denied, the decision would have been today rather than July 10. I don’t know if I can count how many appeals and breaks this ghoul has gotten, and he will probably get another one. What’s the point of having laws if we can just appeal it forever? So, I’m not holding my breath. Although, if I were Mr. Haskell, I’d fire his lame attorney Jennifer Branch. She has a real affection for abortion but can’t seem to argue her way out of a biohazard bag; she’s also defending the last Toledo facility who has been operating outside of the law, just like Mr. Haskell has. I suppose she’s got a thing for criminal abortionists. June 30, 2014 (Cincinnati, OH): As reported earlier today, Hamilton County Court of Common Pleas Magistrate Michael Bachman heard oral arguments for Lebanon Road Surgery Center vs. State of Ohio Department of Health, and upheld the ODH’s order that Martin Haskell’s abortion facility in Sharonville, Ohio be denied a license and closed for operating outside the law. To clarify what this Magistrate Bachman’s ruling means, here is further information and potential next steps: Today, Magistrate Bachman set Thursday, July 10th, next week, for the attorneys for the state to submit a draft magistrate decision (documenting what was decided today). Magistrate Bachman will review this draft, make any appropriate edits, and file his decision with the Clerk of Courts.Attorneys for the abortion facility, or attorneys for the state have 14 days to file objections to Magistrate Bachman’s decision.If objections are filed by either party, the objections go to the original trial judge, Hamilton County Court of Common Pleas Judge Jerry Metz.Judge Metz will review any submitted objections and make a final determination whether to accept Magistrate Bachman’s decision or not. There is no time limit for Judge Metz to make his conclusion.Lebanon Road Surgery Center definitely remains open until July 10th. Whether or not the Lebanon Road Surgery Center requests a second stay of execution from Judge Metz to remain open beyond July 10th remains to be seen. Another possible course of action is that the Lebanon Road Surgery Center could bypass filing objections to Magistrate Bachman’s decision completely, and within 10 days of today’s ruling file a motion to set aside Magistrate Bachman’s order and request that his order be stayed. A motion to set aside Magistrate Bachman’s order would also go to Judge Metz to decide, and the Lebanon Road Surgery Center would continue to operate in the meantime. Regardless of any course of action taken on today’s ruling or not by the attorneys involved, Lebanon Road Surgery Center cannot appeal to another court–should this be desired–until Judge Metz makes his final ruling. BREAKING NEWS: Abortion STILL Murders Unborn Babies. Yes, it’s true: Abortion has always murdered unborn babies regardless of how the Liberal Agenda and Abortion Agenda try to deny it. ‘Reproductive Freedom’ would lend one to believe that means TO REproduce, not DEproduce. It’s been a lie from the onset, a twist of words to confuse rather than define. Case in point: The pioneer of the partial-birth abortion, Martin Haskell, retains attorneys Jennifer Branch and Alphonse Gerhardstein, who make their living defending abortionists and call it ‘reproductive freedom’. Read their ‘mission’ statement here. Ohio Department of Health shut him down, Haskell appealed using Gerhardstein and Branch. And during his appeals process, a stay of execution granted was by Judge Metz, Haskell can ‘do business’, MURDER, until that process concludes. I have to wonder if everyone else should have the luxury of ‘doing business’ while in appeals, such as serial killers, pedophiles, prostitutes, drug lords, rapists, and thieves? Why shouldn’t they be able to continue to ‘do business’ since the stay essentially says that it isn’t illegal…YET. It’s very apparent that this is political, not rational OR legal. They do not abide by the law which was passed to shut down abortionists that do not comply WITH the law, thus “abusing corporate or government power“. In other words, they believe what they want to believe rather than the truth. Remember, attorneys INTERPRET law in order to sway the mind and decision of the judge to their favor. The truth is those they claim to protect should be the unborn because they are discriminated against and civil rights taken away because OF abortion law. These attorneys are no different than the attorneys and Supreme Court justices of the Civil War era that fought for the right to own, buy and sell slaves [the right to own private property] rather than freeing human beings created by God who were deemed no better than a farm animal. We have come so far to make all people equal only to subject our unborn to be lower than a litter of kittens. Gerhardstein and Branch defends abortionists. They are just as guilty of sin of abortion as the abortionist. The reason why Haskell is still aborting, even though the LAW said to cease and desist, is because of Mr. Gerhardstein and Miss Branch. God will not be mocked [Gal 6:7] and will stop this horrific evil of defending the murderers.